Yeah I know that it is too early for review, but i'll write one anyway. So.. Why do I give this novel 5* is because I love the original version of the story and I have no reason to think that reboot version would be worse, because if anything reboots are usually more polished. Some may think that this is just another boring isekai story wich is seen many times already and are not interested to give this a try because of it. So, let me tell you some positive things... more>> (to me at least) about this novel. This reboot is a revised version of the original series. Basically, it focus on the removal of unnecessary (depend on how you see it) details, addition of minor plots, adjustment of the flow of the story. The main plot itself remain mostly unchanged. This is not a new story. Also, this is a slice-of-life, not a battle novel so its tempo is slow. Ojou-sama is less cheap, it takes more time (months - as oppose to a few days in the original series) for Ryouma to become her friend. Her behavior is exactly the same though. Replace the obvious bad guy with an obvious good guy. I don't know if the bad guy will reappear in someway, but for now, I haven't seen him yet. You'll know who I'm talking about if you read both versions. The new character, however, doesn't do anything to alter the flow of the story. Not that he doesn't do anything, but he doesn't do anything significant; at least not yet. A group of background characters got a big upgrade: the group of 6 who secretly follow Ryouma group to collect monster corpses that was left behind in the abandoned mine quest. There's various new small events, interactions with Ryouma. It's a big change. They're more than a mere group of 6 now. New business ideas: it's less than a side job, he completely delegate the entirety of the business to someone else. Therefore, it doesn't affect the main plot. Iron Slime, Metal Slime: they now have a bit of story behind how they came to be able to transform into weapons. Wine Slime (or Alcohol, I don't remember well) : doesn't suddenly appear out of no where, but there's a proper occasion where it was feed wine. New events: these appear around the time of the Treant collection request. These are entirely new contents. I'm not sure where it's going yet, however, as these happen in the time that was originally empty in the original version, I think the story will eventually go back to the original plot. As I remember, the events focus on Ryouma's interaction with other characters such as his employees, the group of 6 mentioned above, the slum, new characters, etc. Look forward to it. As you can see, the author didn't make much changes (if any at all) to the main plot (at least not yet). The revised part progress differently, but the result is the same. The new contents fill the empty time frame (times skipped such as *6 months later*), so they're unlikely to affect the main plot, they do add more explanations as to how Ryouma developed his and his slimes' abilities though. Earlier chapters progress in mostly the same manner as the original, so there's little meaning to read it if you has already read the original story, I think it's better to wait for later parts which has completely new events added, or read it with the mindset of rereading the story. The characters are uninteresting and the setting is inconsequential, combine that with this novel's primary genre - being Slice of Life - and you have yourself a powerful sleeping pill in literary form. The main character feels hollow and empty and spends all his time either researching slimes or inadvertently impressing everyone around him (oftentimes through his slime research, who figured?). The side characters are, to put it bluntly, even worse than the main character in this regard. I read the original and beginning was quite interesting. But it soon started suffering from the slice-of-life syndrome. It's not that it's bad, but it's just not interesting. Also, you can't really call story slow, slow would mean there is still something meaningful happening. It's more like there are large parts of novel that just don't bring anything to the story. If you implanted some kind of progression and plot to the novel it could be great. Characters are just equally plain and don't really have personality. Same with Haruko over there, I read the original translation a LONG time ago. But it’s really good. Also, don’t leave after reading the first part of the prologue because you’d have been fooled. It’s not super mysterious, but the author always makes sure to make you have at least one question on your mind, and they do get answered with time. Now toodaloo. Read this stuff iz güd. Other reviewers have said it already; this novel is mostly slice of life. Even after the reboot, it's still slice of life, just less boring. Comparing this to Death March or Smart Phone, Man Picked Up By The Gods is more realistic, but is slow-paced. The MC's personality doesn't include the doxophobia that Death March's has, and it doesn't include the indecisiveness that Smart Phone's has. 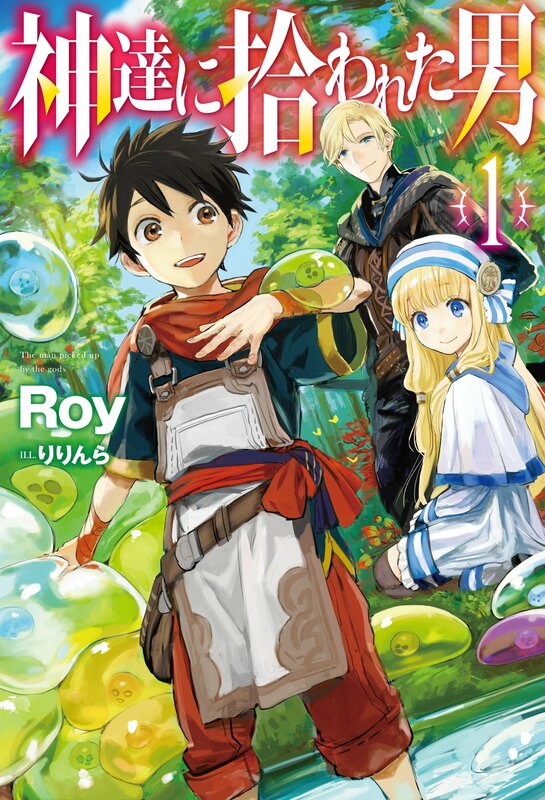 So for those readers whose enjoyment of a novel is based on how relatable the MC is, Man Picked Up By The Gods may very... more>> well be the best Slice of Life Isekai WN for you. Not bad, but be warned that if you're looking for a lot of action and a story driven plot then this might not suit you very well. As of v2c37 there is no progression or even a reason for the protagonist to even be the protagonist other than the fact that he's stronger than everyone and smarter too. Basically, it's a slice of life with some fantasy and minor action thrown in for fun. Plot is more or less none existent so that's why I rated it average at 3/5.... more>> Good to pass time but not for much else at this point in the story. I managed to reach until this chapter, forcing myself along the way but it seems I lost anyway. It looks like I really don't like slice of life type novels. At some points it turns interesting but the regular everyday ongoings are really not of my interest and it's hard to keep reading that way. Therefore I'm really sorry for I dislike not finishing a book or novel I started reading but I can't go against what I deem not interesting. I've read a previous version of this, which is a pretty much identical story with small changes. I actually liked it at first, but this is really quite a tedious novel to read. I came to really dislike MC, who is your average japanese beta. There is too much focus on mundane stuff and food. MC just keeps on blabbering about all the details of what is going on with him and explain himself to others all the time. It always feels like he is looking for validation from others.... more>> He is also quite annoying with "being independent" thing going on. Like Dino Transla said, some of the story line from the old TMPG has been cut and putted a newer once. But still the story has been progressing so far as the MC has been interacting the Jamil Household and how greatly he cares for them. This series had a great start, it was wholesome and fun with a hint of something big going on behind the scenes. But after some point it feels like all of that was thrown away in favor of a "What will I build today", nothing really happens and the few dialogues that show up are all pretty much mundane stuff that offer no growth in any relationship. I dare say this is event worst than those novels where each chapter is just a giant recipe for "food of the day". The story is nice and the Translator is good and has a steady track record. The release speed of the raws is sadly slow at the moment. Compared to the original work, this one is more fleshed out. Simply put, the author got better and he has a second chance. I'm guessing that the author will also fix his flaw of not expanding the world and factions, which lead to him writing himself into a position where a lot of build up would have been required to continue the story. I started reading this series because of the manga but I have read the first couple of chapters and its okay but the problem I have with the series is literally how slow pace it is and honestly doesn't feel like anything ever really happens. If you like slice of life then you might enjoy this series but if you're expecting actual proper plot then there is a lot to desire. This is slow paced, with detailed information in parts, and not a whole lot of character depth. That said there is a variety of characters with enough distinction you can remember who is who. There isn't much conflict or drama and everything is mostly smooth sailing for the protagonist, but the backstory gives reason for this. That is, having cheats that are not overly exaggerated or immediately striking, whilst having the support of the gods and a very kind and highly influential duke family. Ryouma actually develops in the story,... more>> as he does need to study and practice to build up his strength, though he does have starting advantages. His character also gets some interesting development as he interacts with others and grows up from childhood a second time. It is overall enjoyable and fast paced enough that I don't feel like skipping ahead. Reading this light novel is like eating a bowl of saltine crackers without a drink. It's dry and hard to swallow. The premise is traditional isekai. The character is a pretty blank slate with little to expand it. The dialogue is straight forward to a fault. So far, the protagonist is just along for the ride and doesn't particularly care about anything. The dialogue for everyone he meets is so uniformly generic that even the translator misassociates who is currently talking. The reactions and conversation flow is just sort of.. off? Like, soldiers feeling threatened by an unarmed 11 year old boy they found hiding in a bush in the woods. Or suddenly drinking any concoction that said boy hands you without any real second thought. Or being told you just solved a mystery of monster taming that's existed forever and is ground breaking. Then being told shortly after that nobody cares and that the ducal family, famous for taming/invented taming, doesn't know what they're talking about. Look, there's a lack of cohesion and flow in conversation and the situations that still don't make sense for a slice of life. This is doubly bad considering it's the revised version... Lackluster and poorly thought out.